Chhaperia manufactures and supplies polyester heater elements as per your needs. We are certified ISO 9001:2000 in the field of electrical heaters. Since 1994, our works have created a revolution thereby making us disruptive. The standards we maintain in terms of quality products supply is higher when compared to the other industries. This uniqueness has made us achieve many in a short period. Our products made a way in national and international markets and known for on-time delivery, top-notch quality, and pricing. Pricing is a crucial factor which strikes the minds of the individuals. However, being a leader in manufacturing heating elements, our polyester heater elements made a great impact so far. Operating voltage and power ranges from 230V/50W to 230V/70W. The two layers of the polyester film have a nichrome wire wounding. 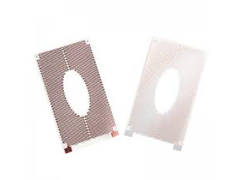 Since it has low mass, excellent resistance, and electrical insulating properties, thermal transfer takes place quicker. Thermal cut-off prevents the system from overheating. Polyester heater elements are widely used in food warming systems. Whether heaters or only elements, Chhaperia manufactures and supplies as per your need.